"My favourite satay is served in the Blue Elephant restaurant in London. The preparation is quick- it is the best if left to marinade for a few hours or more. Skewer up for the grill or sauté on the stove! I buy the chicken tenderloin strips which are already boned, skinned and are of a nice sized piece, which saves time." In a medium bowl, stir together the coconut milk, ground coriander, curry powder, fish sauce, and chilli oil. Add the chicken breast strips, and stir to coat. Cover, and refrigerate for at least 30 minutes, and up to 2 hours. Preheat an indoor or outdoor grill for high heat. Thread the chicken strips onto skewers. Discard marinade. Grill chicken for 2 to 3 minutes per side, until no longer pink. Time will depend on how thick your strips are. Transfer to a serving plate, and garnish with cilantro and peanuts. Serve with peanut sauce for dipping. "Chicken breast meat is rubbed with an intoxicating paste made with cilantro, mint, and other distinctive flavours. Chicken legs may also be used, or a combination of legs and breasts. This recipe is cooked in the oven, but will work well on the grill. Serve hot with onion rings." In a large bowl, grind together the cilantro, mint leaves, ginger garlic paste, lemon juice, green chilli paste, and salt. Place the chicken in the bowl, and rub with the mixture. Cover, and refrigerate for 2 to 3 hours. Preheat the oven broiler. Lightly grease a baking dish. Place the chicken in the baking dish, and broil 20 minutes, or until chicken juices run clear. The 1980's saw a fashion revolution in Bangladesh. Plastics were taking over terracotta and silver; nylons displaced the ages-old heritage of cotton and silk. It was not only a battle between tradition and modernity; it was also a confrontation of lifestyles and values. Now the tide is changing again, and the time has come to strike a balance. While fusion highlights pop high fashion, a subtler genre must evolve that will appeal to the mass, the fashionably sensitive and a world market starved for the spicy colours and hues of the subcontinent. And it has! Recently, designers, western and eastern alike, have cross-pollinated the East with the West, blurring their influences in a kaleidoscope of colour, accessories and trends. The result? A dazzling mix of must-haves like sari-style gowns, opulent silk, rows of glinting bangles, and a juicy palette of lime green, orange, butter yellow and bright pink. This season's ready-to-wear collections will feature Eastern accents like draped dhoti pants, silky tunic-trouser sets, metallic tunics and light as air saris- simple, luxurious and oozing understated sexuality. With an array of distinguishable features by fabric, draping style and motifs, the sari shall stand out as a bright beacon of style in a sea of basic black. In an attempt to merge experience with the skills of the craftsmen, designers, and quite wisely so, have became aware that contemporary designers must revitalise their own roots and identity. This is essential to take Bangladeshi creativity out from the local industry and out into the world in a way that benefits both craftsmen and the modern consumer. 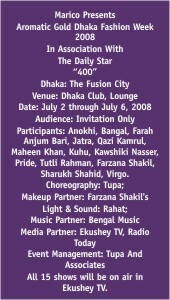 Dhaka Fashion Show 2008, arranged as part of four hundred years celebration of Dhaka, promises to break virgin ground. Fifteen designers presenting their work in a myriad of variations of themes- the ensemble certainly assure a fashion fiesta. With over a dozen shows, each unique in its distinctive style and form, the challenge is to present them in a manner coherent to the theme of the show "The Fusion City" yet unique in essence. The crafted designers of Bangladesh have been exposed to the colours of a country rich in culture and diverse in its people. As an inspiration, the country has it all! With a focus on the capital, the creators of 'wearable' art are confronted with the creative challenge of transforming inspirations derived from the lifestyle, culture and nature. From villages where local craftsmen weave dreams with magic fingers, to factories, workshops and outlets where retailers jostle for survival, to the opulent grandeur of boutiques and malls, Dhaka Fashion Week 2008 will certainly lead the style sensitive to new doors of discovery. The ensemble quite certainly, holds the key. “WHERE is it?” you may ask. “I've never been there” might be your immediate reaction. Let me tell you. Raipur is the capital of Chhattisgarh, a state that was, till a few years back, a part of Madhya Pradesh the middle of India. I can almost see the nodding heads. Now it makes sense. That's the state with Khajuraho temple and Chambal and Gwalior Fort. Right you are. Despite proximity of Khajuraho and Gwalior, and proximity is a relative term as India is a vast country, Raipur has never to my knowledge set the culinary rivers on fire. So, when it dawned upon me that an overnight trip to Raipur is imminent, mentally I panicked. And since there was no time for any research on the place, resigned myself to a night of the usual chicken tandoor and tough as rubber naan rotis. Well, this particular trip was a two-city coordination. My colleague and friend from Mumbai were also coming (she, the one who introduced me to Gomantak food). And I would fly out of Calcutta with another colleague. Raipur being almost in the middle of the two cities, it was easily arranged. My friend from Mumbai was supposed to reach about four hours ahead of us. Being a fellow foodie, she assured me that a due diligence of the food options would be done. Needless to say, I completely trust her on these things. Our flight landed on time. Stepped out of the cool comfort of the cabin to be immediately slapped by forty-five degrees celsius. Everything was shimmering. And it was dry heat. Not the kind of sweaty heat we are used to. Thankfully, a very nice car was arranged for us, which took us to the hotel, a short drive from the airport. On the way, my foodie friend called me. And with interesting news. Apparently, the hotel that we were booked was holding a Mexican food festival. You've got to admit. That is the last thing you would have expected in Raipur. But such is the story of changing India. Smaller cities are becoming part of a larger canvas. And let's not forget, Raipur is a capital of a state. Very excited, we touched base on some work. But that was completely incidental. We quickly changed and went down to have dinner. We were welcomed by something, which we never anticipated in our wildest western dreams. The courtyard of the hotel had been completely transformed. Two large black horses, fully saddled, were at the entrance, whinnying at people. Every waiter was clad in black, even in the searing heat. Everyone was wearing the signature cowboy hat. A large screen silently showed good man Clint Eastwood dealing with baddies in his inimitable ways. Very large speakers were blaring out music by any artist remotely Latin in nature. Ricky Martin, Shakira, Jennifer Lopez, Gloria Estefan; you name it, they were playing it. The most interesting part of the décor was the menu card. Shaped like an old six shooter, they were stuck in holsters with the waiters. So when you asked for the menu, they were drawing it, not just giving it. Food was a fuzz of enchiladas and soft tacos and burritos. Everything was uniformly sour with tomatoes and lemon. Everything had the same indistinguishable filling, which could have been anything from beans to mince meat to potatoes. Even the rice took a red accent. But all that was perfectly acceptable once the ambiance took the front seat. Somehow, we went back to our rooms, very replete, wondering, did this actually happen? Under a hot starry sky, in the outskirts of Raipur, did we actually experience a Mexican food festival? Or has this all been one surreal experience?